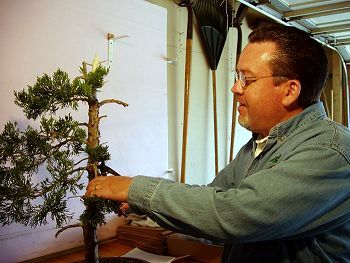 Better Bonsai: "Unruly Juniper: Leaning and Leaner"
Scott Day of Springfield, Illinois wanted to make a dramatic change in this juniper. The trunk, lacking taper, was overwhelmed by the oversized pot, numerous branches, and large amount of foliage. The original apex had been jinned and was now insignificant next to the contrived new apex which bowed around the jin. The branches on the right were all approximately the same length, giving the tree a boxy silhouette. All branches were leggy, lacking taper or foliage near the trunk. To bring power and focus back to the trunk, branches needed to be cut. Scott removed more than half of the branches, leaving 1 to 2 inch stumps to be jinned. Removing most of the new apex made the old apex prominent once again. However, the foliage mass on the remaining branches was still too overpowering and unruly. After reducing the number of branches and shortening the tree, the oversized pot seemed even larger. 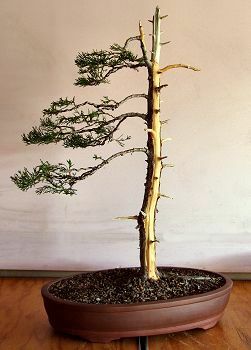 After some jin refinement and the creation of a shari (dead trunk) line connecting the dead apex with most of the dead branches, the remaining branches were wired and shaped. The long, leggy branches with their soft movement evoke a windswept design that harmonizes well with the gentle flow of the trunk. The jin and shari give this relatively young tree age and character. To complete the look of a dramatic windswept, a new pot is called for. 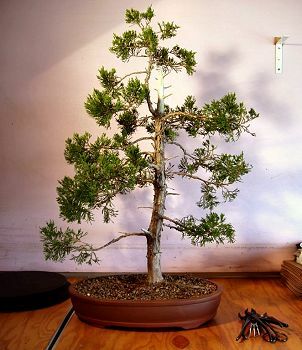 The tall, thin trunk and sweeping branches would benefit from a long and shallow pot. By changing the angle of the trunk a few degrees to the left, the tree will feel like it's leaning from the power of the wind. © 2006 Cheryl Manning. All rights reserved.